Now through February 27, 2015 we are offering end column pricing on our very popular (and very eco!) 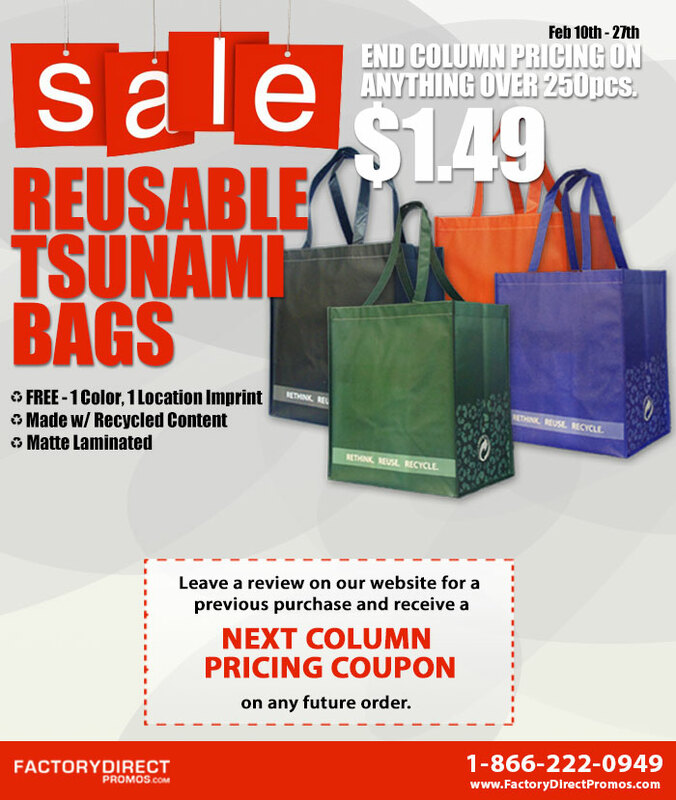 reusable tsunami bags. If you’ve been thinking about placing an order for reusable bags, now is certainly the time to get these durable, certified reusable bags at an even better than normal price. Our reusable tsunami bags are the quintessential grocery bag and they are fully certified, quality controlled and lead tested. The durable design can easily accommodate a heavy load of goods, while the handles are comfortable and easy to carry. The laminated finish not only lends to the durability of the bag, but it contains spills, leaks or condensation. The flat bottom design folds very compactly and stows in your car or a desk or anyplace where space is a premium. Like all of our bags you can customize your tsunami bag by imprinting your company’s logo or a branding message. 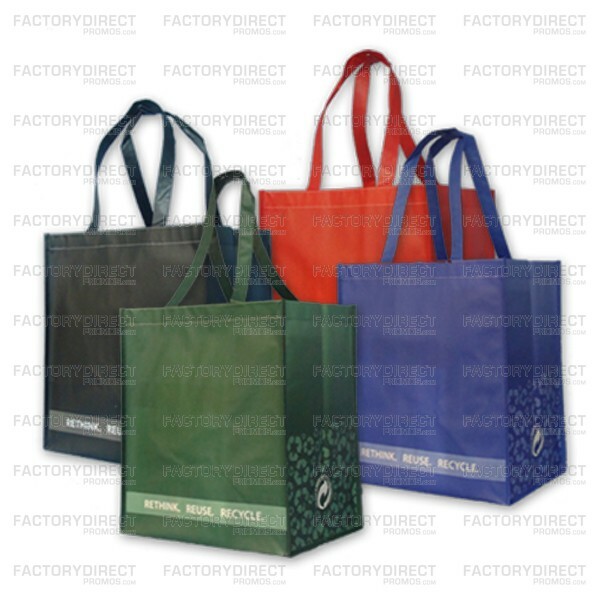 Choose the color of your bag and the imprint color (remember, we can match to PMS colors) and this bag will be cohesive with your existing branding. If you want to further custom your bag we can help you that, too. Maybe you want to adjust the length of the handles, or add some type of closure, or maybe you had something else in mind. Let our talented design team know what you’re thinking and we’ll figure out how to make it happen. The advantage of customizing a reusable bag is that you can create a product that works for your customers. Reusable bags are pretty useful as they are, but when you can build in extra functionality that is what will make your customized bag stand out and make it the go to bag your customers reach for when they head out. We’ll extend end column pricing on orders over 250 pieces. This includes free one color, one location printing on our matte laminated reusable tsunami bags. These reusable bags are made with recycled content, making them environmentally friendly. To further sweeten the deal leave a review on our website for a previous purchase and receive next column pricing on any future order. Are you ready to place an order? Do you have any questions about the ordering process or do you need a quote? Let us know HERE and we’d love to help you out! Just remember that in order to take advantage of this great end column pricing deal you need to get your order in by the end of this week.